Kelly Price Talks Kanye West's The Life Of Pablo: It's "A Street Parable"
Kelly Price, the powerhouse vocalist who's been working in music for the past quarter century, is not a gospel singer. But her core-shaking R&B has roots in the church. Price blessed the Saturday Night Live stage this past weekend, performing with Kanye West and a multi-generational team of music greats that also included Chance The Rapper, El Debarge, Kirk Franklin, Young Thug, and The-Dream. The performance was the culmination of a quick and intense collaboration with West on his new album The Life Of Pablo, which Price sang on three songs for, and became involved in just weeks ago. 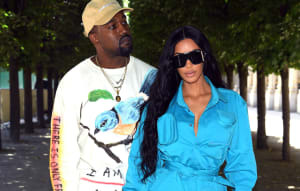 Over the phone from Los Angeles on Monday night, she called the connection between the album's collaborators “spiritual.” In a short conversation, she detailed her experience “anointing” instant standout "Ultralight Beam," and explained why she believes Kanye's new album can really be categorized as gospel. How did Kanye reach out to you? So that’s exactly what I did. I did my song and I got it back. He listened to it, they were freaking. They loved it. They called me on ten. That was on a Tuesday. When he called me back he was like, "I’m going to need to you to fly to L.A. on Friday." He’s like, "OK, someone is going to call you in a couple of hours and get you a flight." It literally moved that fast. That was like three weeks ago. The album's ideas came together so quickly. And a lot of magic happened. I really believe that Kanye's been living with his vision and with the music and envisioning what he wanted. I think once he figured out who the key people would be and how he would bring out the key things that he wanted to bring out, he just moved on it quickly. But he’s been living in the studio for a minute. He wanted the right people on the right stuff. I had a ball in the studio when I got to L.A. Everybody doesn’t get to be around the behind-closed-doors Kanye, but I had a great time working with him. Prior to this experience, had you ever envisioned yourself working with Kanye? I’ve been in the business for 24 years now as a paid professional and I’ve worked with a lot of people and I’ve seen the transitions of the industry. A lot of the younger artists can be incredible and really gifted but they don’t necessarily also acknowledge the people who come before them. You have people who will say, "I love Aretha Franklin, or Kool Moe Dee, or Run DMC." But you have people who came in between the time that generation was there and the new generation of musicians, and performers who are here now who made great impacts on the music industry. The kids who are coming up now grew up on our stuff but they don’t necessarily pay homage to it. To hear Kanye talking about listening to the music that I was very much so apart of, during the Bad Boy days, and how much it influenced him and how he wanted to embody that? It was pretty incredible. I always felt like he is incredibly creative. Really not just a musical genius but a creative genius. He has so many things that he can do. It's a lot to embody and house inside of one person and he has to get it out in the the best way he can. To me, he was incredibly gracious and over the top respectful. He honored me for what it is that I do musically. I thought that was really incredible. What was it like to perform "Ultralight Beam" with so many people on SNL? It looked so fun. That song comes from a very deep place. In making “Ultralight Beam,” Kanye was very clear on what it was that he was trying to do. No matter who we are and where we come from, there are some things that everyone can relate to. Everyone can relate to what love feels like. Everyone can relate to what pain feels like. There are certain things that everyone will experience, like death and sickness. Those are things that are common to humankind, and “Ultralight Beam” is the kind of song that would be common to humankind. It doesn’t mater who you are, there is always that light. And there’s a way to get that across. Everybody might not want to say God, everybody might not want to say Jesus. People have different things that they believe. But there are lot of people who know that there’s something greater than any human force or person in this world and they look to it for inspiration. I think it was part of the goal, to put that idea out in a way that everyone could relate to. And to bring me in on it was because Kanye did want that church feel. In Kanye’s words and in Derek's words, they said that wanted that, “anointing” on the song. So that’s another chuckle point for me. I’m a church girl and I grew up in the church but I’m an R&B singer. I’ve never been a gospel artist. But that sound is embedded in my music and it’s part of where I come from, so I understood exactly what it was they were looking for. Do you have your own connection to “Ultralight Beam?” Do you have a visceral reaction to the song while listening? I did. When the music was first sent to me, it was kind of skeleton and bones. There were some little things that were on it but Chance The Rapper’s verse was not on it at all. I knew the song was called “Ultralight Beam” and I did hear some of the things that Kanye was doing. But other than that, Derek just sent me the track and said, “I want you to write what you feel.” We did have a spiritual connection in putting this song together, because for me to not know what Chance was going to be talking about and to write the way I wrote not having heard anything that he was going to say—it was like we were together and had a conversation about what we were going to say. But that didn’t happen. You would’ve thought you were in the same room. Right, but we were on two totally different sides of the country. Kanye has said that The Life Of Pablo is a gospel album. You’re an R&B artist, and your music has really rich and soulful sounds reminiscent of a lot gospel music. How do you feel about him saying the album is gospel? I understand what he means. Kanye is not trying to be a preacher, that’s not the point of “Ultralight Beam,” or The Life of Pablo. He’s done an incredibly brave thing to say that he wants to call this a gospel album. Even though it’s not a traditional one thematically, listening to the bare bones, it is. I can listen to it and hear messages of hurt, shame, anger, and fear, and then I can turn around and see hope, faith, redemption, compassion, rejuvenation, forgiveness, and getting up from a fall. All of those messages are on this album. I told him that Jesus taught in parables. He’s very intelligent so he was aware of that. But to describe my point—Jesus taught in parables. Parables are stories that people could understand. Jesus didn’t use what would have been big confusing words in that day, he spoke in plain English. So if he wanted to talk about sowing and reaping, he would tell a story about a farmer and harvest as opposed to putting the spiritual spin on it. That was Jesus’ style of teaching. So what I feel like what Kanye did was—he’s taken the ugliest things about life, the most turnt up stuff about life that isn’t necessarily coming from the best place. But it’s Kanye talking about his life and his life experiences. It's also talking about when you’re coming from a place where you feel so low, and feeling like you’re not worthy for anybody to forgive you or to love you or to have mercy on you or to show grace. So when you say gospel, I choose to look at the word gospel for it’s definition according to the dictionary, which is: "good news.” To me, when you can bring good news to a person about anything, you’ve delivered the gospel to them. Gospel is more often utilized in religious terms but the word gospel isn’t necessarily religious. It’s good news. On the album there are all these experiences—whether he’s talking about partying, or being with a girl. He talks about low points where he’s felt like, "This is the most horrible moment of my life." To get up from that place and feel like you’re in a position to feel like you’re worthy to be loved and to achieve greatness and to have a great life? To me, if that’s not really the gospel, then what is? To the kid who’s walking a Brooklyn street or on the South Side of Chicago, who is not going to walk into a Baptist church, a mosque, a temple or any kind of place—this just may be something that says to them, “I don’t have to stay where I am. I can get back up and dust myself off. I’m worthy to be more than someone who keeps making mistakes or never gets it right.” To watch social media and see people saying, “I’m listening to 'Ultralight Beam' because when I listen to it, it just makes me feel like I can get up and go and move. It makes me feel closer to God.” What more can you ask for? "Ultralight Beam" is the kind of song you play to get yourself started, to get your energy right. Yes. I’m very proud of it and I’m very proud of Kanye. I’ve been around for so long and when I meet and connect with artists who are younger than me, I feel like I have all of these little brothers and sisters. He’s like my little brother. The best thing in the world for me was to meet him and to start to get to know him personally, because his heart is so misunderstood. I can say that without flinching. I know him now. I’m not looking from the outside in. I know Kanye West, I ride for Kanye West. Kanye and I ended up doing a lot of stuff [in the studio], so there will be things that come trickling down the pipeline. Kanye's on a journey just like we all are. The Life Of Pablo is a good way to show people where he is right now. I just really hope that people will try to take a look at his heart. For the ones that don’t, there are enough of us that see it.